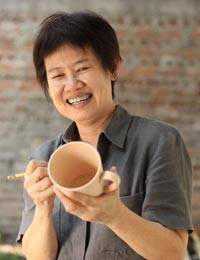 Expert in the antique art of celadon ceramic, Duangkamol crafts an exquisite design. The petite but voluptuous vase is adorned with lotus petals in low relief and features a pale green glaze with the characteristic crackled finish of true celadon. 8.5 cm H x 9.5 cm Dia m.